To celebrate the ten year anniversary of FiberScene, we will explore some of the recent work of artists that inspired the website. We are strongly committed to supporting and promoting the work of San Francisco Bay Area fiber artists, and we want to keep you updated on the scene as it grows and develops. Virginia Davis is our first featured member. Her activities as a scholar and educator in the Bay Area has influenced a new generation of fiber artists, challenging them to explore weaving and textile traditions within a modern context. Davis was a part of the legendary Fiberworks Center for the Textile Arts in Berkeley, California during the 1970s. She continues to teach workshops and give lectures on ikat and ethnographic textiles. Through grants and fellowships, Davis traveled to India and Mexico to learn more about ikat and weaving traditions. 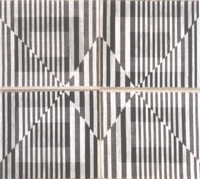 Davis openly references art and textile traditions with many of her pieces, often prompting a discourse about the separation of textile work from other art forms. While her work is generally recognized as textile art, the subject matter and style places it squarely in the realm of painting. Critic Patricia Malarcher poses the question “Are these painterly weavings or weaverly paintings?” Indeed, the elements of weaving and painting are equally matched within each piece. 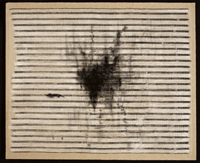 Davis’ work references a variety of 20th-century artists, from Bauhaus minimalists Josef and Anni Albers to abstract expressionist Mark Rothko and pop culture icon Andy Warhol. However, her style breaks new ground by incorporating her extensive knowledge of textile history. Instead of merely painting the canvas, Davis uses a mixture of ikat and painting techniques to achieve an extra depth of field and richness. Ikat is a technique where threads are dyed before being woven into fabric, creating a characteristic blurry-edged woven image. We hope you enjoy this closer look at one of our beloved Bay Area artists! Two modules on the right are available.